25th June 2009. New Products in the Shop, ExplorOz Sand Flag, New Forum Layout, We Want Your Say in Polls, and 2 Updated Treks - Windjana Gorge and Tunnel Creek, and Black Point. It's been a busy fortnight on all fronts at ExplorOz. 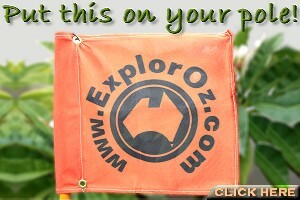 We are particularly pleased that the ExplorOz brandedSandflag is now available. You can get this separately or get theSandflag Kit. ExplorOz branded flags are now on their way to anyone that had pre-ordered. 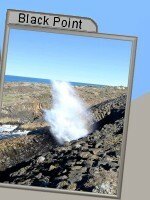 We have produced 2 new trek notes that have been completely updated, beingWindjana & Tunnel Creek, andBlack Point. TheHema Navigator, is back in stock and now with updated street data, higher resolution topographic maps, and a revised mount and charger. For a limited time anyone purchasing the Hema Navigator from ExplorOz will also receive a freeWA Road and 4WD Atlas DVD. These new Gregory’sMap andBook titles have just arrived and the Field Guide to the Birds of Australia by Pizzey and Knight, is a quality addition to our growing Reference category. 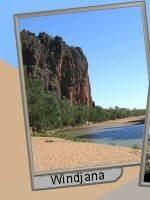 New and updated editions of the Camping Atlases ofNSW andWA, Cape York a 4WD Experience, 4WD Tracks in Tasmania, Grey Nomads Guidebook and the newNorth Australian Fish Finder 8 are also all in stock. There are dozens of new products added to the Shop, including updated editions of some of our most popular titles so why not take a moment to browse theShop now. Since our last newsletter we've made some minor layout changes to theForum - the most obvious of which is the top box giving access to various Forum features and shortcuts to popular site tools. Of particular interest is the new tab "Poll". The second is a public poll - "public" means anyone using the site, not just registered visitors or members can vote. Voting in public polls is done via the new tab added to theForum. Your vote gives us statistical data on which we can measure how the "majority" of our audience responds to an issue, so if you have an opinion, vote and let it be counted! Who are our new Business Members?